Campion Cycle Co., Ltd., Robin Hood Street, Nottingham. 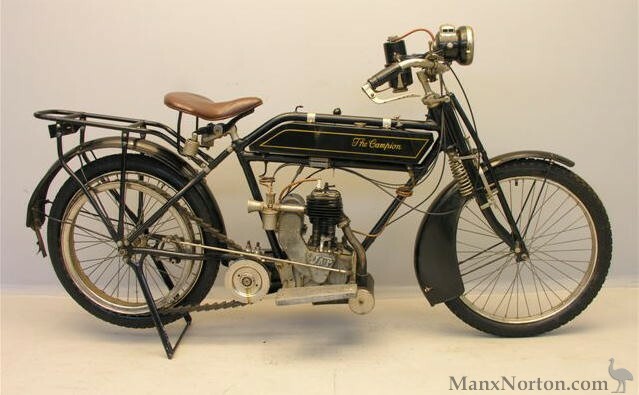 Campion built motorcycles from 1901 to 1925-26 utilising Minerva, Green, MMC, Fafnir, Villiers, Blackburne and Precision engines. The company also built bicycles and in 1913 built a cyclecar. They suppied frames to several other manufacturers. The 1915 770cc V-Twin employed a Jardine gearbox, Druid forks and Splitdorf magneto. Some models of this vintage were fitted with Dixie magnetos, also made in America, and many had Miller acetylene lighting. "A full and complete range of motor cycles of this manufacture are staged on this stand, including two of 250 c.c., one sidevalve, and one overhead-valve. Both are single-cylinder machines and the overhead-valve models are particularly adapted for sports work. Blackburne engines are fitted throughout and Sturmey-Archer three-speed gear boxes. The transmission is by chain in all models, and both front and rear brakes take effect on the hubs. A B.T.H. magneto is fitted and 26 by 2 1/2 in. Dunlop tyres. A special feature of all models is the new pattern Campion Aero front fork. Currently researching and producing a book on the Campion Cycle Company, any help would be appreciated. I can help re your machine?